How to replace the session in web asp.net c #? Let's see, I'll explain in more detail what happened. I have a texbox and a button; what I want is to enter data to the texbox and when I click on the button I redirect to another page getting the value of that texbox. For that I am session to store and then in the other window that will redirect me and show it. This is the image of my codebing when I click on the button. 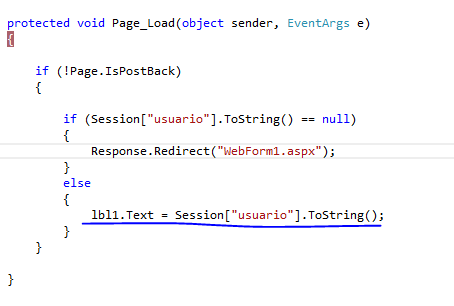 Now to get the value of that session and to show in a texbox what I do is in load (), like this code in my webform2. Now when I run the application, log into my webform1.aspx and put the name in the texbox: "name1" if you redirect me to webform2.aspx and if my "name1 is displayed ". Now the problem is that when I open another tab and put the webform1.aspx and place in the texbox nombre2 if I address to the other page and if the second name that I placed now comes back to the previous tab and update the page the name has changed and that is the problem. How could it not be changed or what method is to replace the session ?, Since what I show is something small but according to my question because in my system the same thing happens and I would like to have the name that is placed, imagine that a user enters and registers something and is well registered with his first name that he entered but then he enters with his other user and registers everything. Now in the session it will take it with the second user and not with the first one and it would cause problems. Suppose we have a website with a simple login. A user name and password are requested, it is checked in database that this user exists and according to the answer, we allow it to be accessed or not. int id = // identificador que obtenemos de la bbdd. Thus, in the case that the user had not previously logged in, he creates the session variable. And if he had already been logged in, we do not do anything, since the session variable already exists. But for this to work, you must also propagate this id throughout the application (for example, you can send form login to the form home this id by url). int id = // identificador obtenido desde otro formulario mediante url. I hope you have explained me well and that it will be useful to you. With this, what we do is create a "single session variable" for this user, and we send the name by url to WebForm2. 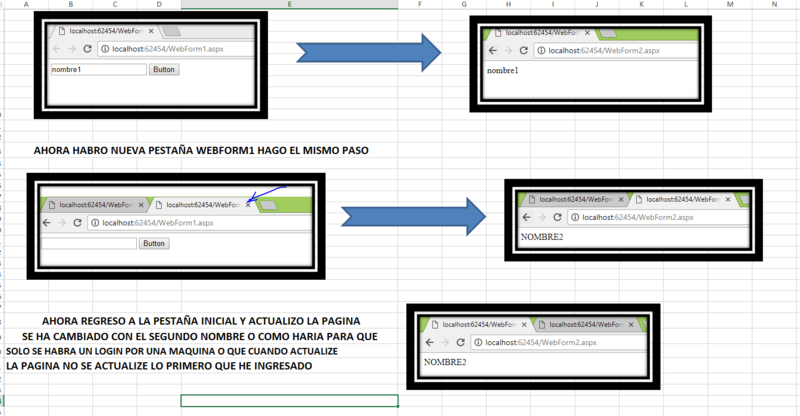 In this way, in WebForm2 we check that we receive the value u by url and we use it to create the "single session variable". If it did not exist, we send it back to WebForm1.aspx. Perhaps this is not the most correct way to do it, since simply using the value u that we receive by url we have the name, but as an example to clarify a bit Things are fine. To others, in the example I have not done either but I use to encrypt all parameters that I send by url. The problem is that when entering the Login, you do not have a validation to know if the user is authenticated. Likewise, when you do the Logout to the user, you must destroy the session variable so that when they log in to the login as a new user. I do the same thing I keep the user ID in session variable or in a cookie if the client wants to keep his session started, I also noticed the case you mentioned, for this I did the simplest thing that can be done, at the moment of going to the login, exactly in your event onload I eliminate the session variable or in its defect the cookie, of this form no user will be able to accede at the same time that the session of another one lasts, because the previous session will already be closed when opening the login form.